There are many fascinating places in our solar system toexplore, but space missions are dangerous and expensive. Sending robots insteadof people helps reduce these drawbacks. For this kind of exploration, ProfessorBernard Foing looks to the Moon, Mars and beyond, hoping to discovertantalizing secrets useful to astrobiologists. 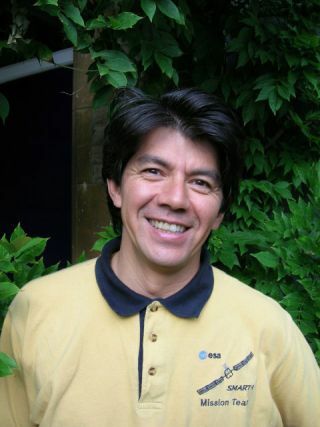 Foing is the senior research coordinator at the ESA spacescience department, and executive director of the International LunarExploration Working Group. Foing has developed instruments used on spaceprobes, and is known as the father of the successful SMART-1 mission to theMoon. "SMART-1 has shown that Europe alone can buildan effective mission to the Moon," says Foing. "The next step is touse our expertise to develop lunar landers and rovers." Foing says his team is now analyzing the data of SMART-1,which spent 18 months orbiting the Moon and mapping the landscape withmicro-cameras, infrared instruments and x-ray instruments. Information such asthe chemical composition of certain regions can teach us about the Moon'sorigin and past; high resolution images also can point to places where futurelanders and rovers could be sent. Foing sees potential in using our Moon as a uniquelaboratory to export life from Earth to other worlds. "I am interested in the aspect of expanding life onother planets," he says. "For instance, looking at places where wecould deploy bacteria experiments or life science experiments that could helpto develop life support systems. In the future we would have humansettlements that would grow on what we learn from life scienceexperiments." Foing says a second biosphere could be built on the Moonwhere humans would be able to live. The initial stages of creating habitableareas on the lunar surface almost certainly will be conducted by life scienceexperiments on robotic missions. Foing describes the plan as a four-stage program. First,using orbital precursor missions like SMART-1, robots map the Moon in detailand learn about lunar geology. The next part should come after 2010, when avariety of probes from different countries will be deployed on the surface,working in concert on various activities. After that, infrastructure andlife-support systems will be constructed and visited for short periods byastronauts. The final stage will have outposts and a permanent human presenceon the Moon. These plans may seem ambitious, but internationalcollaboration is contributing more than ever before. "We are offering someof our SMART-1 data to help other countries to prepare their missions,"explains Foing. "With our ESA ground stations, we are helping the Chineseto double the amount of data they are going to downlink with their Chang'e 1mission." These aren't just one-way deals though, since data and equipmentcan be shared between all space agencies. The Chinese Chang'e 1 mission, Japan's Selene-Kaguya, and the United State's upcoming Lunar Reconnaissance Orbiter and LCROSSImpactor will all provide valuable data. "We are looking at ways where we could exchangeinformation and carry some instruments from other countries on ourplatform," adds Foing. "Also, some of our European instruments can becarried onboard landers from international partners." Foing's research takes him further afield than our naturalsatellite. He is involved in the ExoMarsproject, a mission that will be launched in 2013. "In the case ofExoMars, we are going to deploy instruments that will search for signs ofextinct or extant life," he says. "It has a battery of organicsensors and life search instruments. We also have also a series of geophysicalinstruments like the camera system which I am involved with." Robots with instruments such as these are at the forefrontof our exploration strategies, making it possible that if we do find alienorganisms, the discovery will be made by a machine. For Foing, the search for lifeon Mars is a key aspect of our investigations in space. "We believethat in the first billion years of its history, Mars had some habitableconditions," he says. "So maybe life developed there — a secondgenesis — or it may have been transported from Earth. Answering this veryimportant question about life on Mars requires sensitive scientificinstruments, because for the last three billion years, conditions there havenot been hospitable on a cold and dry Mars. "So if there is evidence forpast life it may be difficult to find. Foing also thinks our investigations should take us beyondour own solar system. Astronomers are now searching for the ingredients oflife, such as amino acids, in the vast reaches of space. Eventually thesefar-flung elements reach the surfaces of planets throughout the universe, andincrease the chances that life will arise there. In the next 15 years, he says,missions like the Darwin infrared interferometer will be able to search forsuch biomarkers on Earth-like planets around other stars.